Infielder Edmundo Sosa will join the Cardinals after spending the 2018 season between Memphis and Springfield. 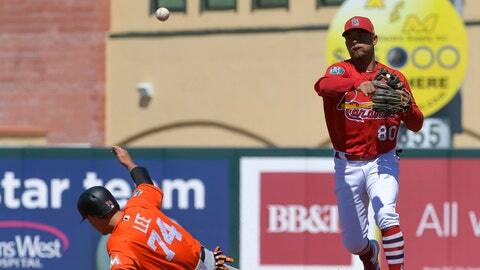 ST. LOUIS – The St. Louis Cardinals have recalled rookie infielder Edmundo Sosa from Memphis (AAA). Sosa, 22, has split the 2018 season between Springfield (AA) and Memphis (AAA). He has combined to hit .270 with 12 HR’s, 30 doubles & 59 RBI in 123 games in the minors this season, starting games at second base, shortstop and third base. Sosa was named a Midwest League (A) All-Star in 2016 and an Appalachian League (R) All-Star in 2015. He was a member of Team Panama in the 2016 qualifying round of the World Baseball Classic. Sosa will wear uniform no. 63. The move expands the Cardinals’ active roster to 36 players.